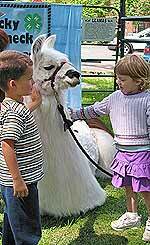 The Lucky Longneck Llama 4-H Club participated in the 2005 OSU Veterinary Medicine Pet Day on April 30th. Club Service. The club participated with the Koenigs at Pet Day on the OSU campus. 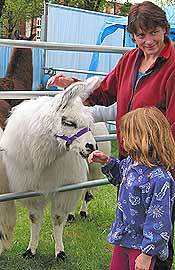 This year the Koenigs and some club members groomed eight animals then shared them with the public as part of Pet Day. We started the morning with gray skies, but the clouds broke a few times in the afternoon for a very nice day. One of the great features of Pet Day is the number and types of pets that show up with their owners. This year we saw a number of animals being carried including an iguana, a number of ferrets, a snake (actually all that was seen was the snake's tail sticking out of the owner's shirt) and many breeds of dogs ranging in size from a chihuahua to a great dane and a couple mastiffs. 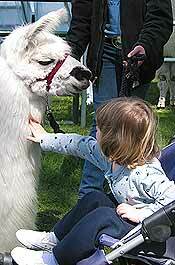 Gold Sparkle (the llama in the picture to the left) kisses the hand of a girl and gets some pets. 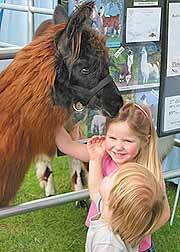 Hi Hopes (the llama to the right) decided to lie down which made it nice for some of our shorter visitors! 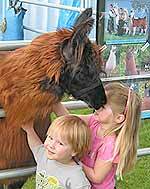 Leap of Faith (the llama in the picture to the left) starts with a polite kiss on the top of her new friend's head. Then "Faith" (in the picture to the right) decides to plant a fuzzy kiss on her friend's nose! Here is another picture of Hi Hopes saying hello to a little girl in a stroller. "Hope" has decided that lying down on the job is OK and her new friend is able to pet her more easily.